FLOSSMOOR, Ill. - The Cleveland State women's tennis team extended its win streak to five straight and remained perfect in Horizon League play with a 7-0 victory over Valparaiso on Saturday at the Homewood-Flossmoor Racquet Club. CSU improved to 13-10 overall and 4-0 in league play, while the Crusaders fell to 0-10 overall and 0-5 in the Horizon League. The Vikings made quick work in doubles, losing just four games in the three matches. The No. 1 doubles team of Charlotte Gibbons and Catrine Bjerrehus earned an 8-1 win to extend their win streak to 11 straight. Nicole Janek and Maria Lazaris earned an 8-2 win at No. 2 doubles, while Sanda Bjelan and Mengdi Liu won at No. 3 doubles, 8-1. "Our doubles play has continued to get stronger and stronger as the season has progressed," head coach Brian Etzkin said. "It is always important to get that point and gave us a lot of momentum heading into singles. Once there, I liked what I saw from every position and we have to take the same kind of intensity and approach tomorrow at UIC." Bjerrehus won dominant at No. 1 singles as she did not lose a game in a 6-0, 6-0 win. Janek was just as good at No. 4 singles, picking up a 6-0, 6-0 win. Lazaris earned her team-leading 18th win of the season with a 6-1, 6-0 triumph at No. 2 singles, while Gibbons won her team-leading sixth straight match, 6-0, 6-2 at the No. 3 position. CSU continues its weekend roadtrip with a 12:00 p.m. contest at UIC on Sunday. The Flames are also 4-0 in league play this season. Oberlin, Ohio - Ben Puterbaugh broke the single season hits record, Max Phinney continued to be clutch, and Phil Brua was pretty good too as the Oberlin College baseball team defeated Kenyon College 5-3 and 8-5 on Easter Sunday. Puterbaugh, a native of Canton, Ohio went 4-for-6 on the day with a walk and a hit-by-pitch. In the four-game set he batted .818 as he was 9-for-11 with two home runs, two doubles, four walks (one intentional) and one HBP. Moreover, he was a perfect 14-for-14 on fielding chances at the hot corner. Puterbaugh now has 44 hits in just 20 games and is riding a 14-game hitting streak. The junior sensation has 17 multi-hit games on the year. 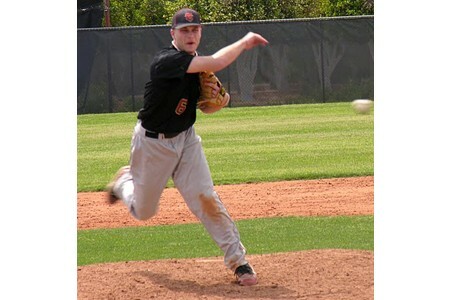 He surpassed current assistant coach Seth Binder who had 43 hits in 40 games during the 2006 season. In game-one the Yeomen posted five runs in the first inning and made it stand up the rest of the way. Following a bases-loaded walk to Ben Kauder, it was Phinney who came through with a scorching double to the left center gap to clear the bases. Oberlin would add its final run on a first-and-third double steal. Two Oberlin miscues in the first led to two Kenyon runs, but starter Jack Dunnwas settling in until a scary moment in the top of third forced him to leave the game. However the Yeomen turned to Phil Brua to shutdown the Lords bats and that is exactly what he did. The Avon, Ohio, native worked the final five innings and allowed just three hits and one run while fanning five along the way. Phinney finished a perfect 3-for-3 while Puterbaugh and Jason James also added a pair of hits in the game. In the nightcap the Yeomen benefited from five Kenyon errors and sound pitching. Oberlin (14-6, 7-1 NCAC) trailed 3-0 going into the bottom of the third inning until a throwing error by the Lords’ shortstop with two outs led to three Oberlin runs on the same play to tie the game. Rookie Eric Knight would then make it a four-run inning for the Yeomen with a single to left center to score Ben Kauder. The Lords would reclaim the lead with a pair of runs in the fifth, but Oberlin got things back to even quickly on Knight’s second run-producing hit of the game in the bottom of the frame. With the score now tied at five, Yeomen bench boss Eric Lahetta would again turn to Brua on the mound and the sidearm specialist would not disappoint as he allowed just one hit over the final two innings to earn his second win of the day and fifth of the season. The Yeomen put Brua in position for the win by posting a three-spot in the bottom of the sixth. Rookie Zach Jaspers started the inning with a pinch-hit single through the right side and he would later score on a single to right field by Brandon Cantrill. On the play the Kenyon outfielders made two errors, which allowed Pat Bourke to score and left Cantrill on third base. He then provided the final OC tally on a bunt single by James. Cantrill got the start on the mound and allowed five runs (four earned) while walking three and striking out two over five innings of work. The Collins, Ohio native threw 86 pitches, 51 for strikes. Oberlin returns to action on Tuesday night at the Pipeyard in Lorain, Ohio, as Bluffton comes to town for a 5 p.m. doubleheader. Fans can follow all of the action pitch-by-pitch via live statistics. The Malone University baseball team wrapped up its four-game American Mideast Conference weekend series with Mt. Vernon Nazarene University on Saturday at MVNU’s Cougar with another doubleheader split. The Pioneers held on for an 11-10 victory in game one before falling 5-3 in the finale. Just like in Thursday’s contests at Thurman Munson Stadium in which Malone claimed the opener 5-4 and Mt. Vernon Nazarene took the nightcap 4-3, both of Saturday’s games remained close from start to finish. The two squads concluded their evenly-matched series with all four of their games having been decided by a combined total of five runs. Following Saturday’s split, Malone’s record moved to 22-7 overall and 6-2 in the AMC while MVNU now holds an overall mark of 15-9 with a 2-2 conference record. The Pioneers scored six runs in the top of the second inning to grab an early lead in game one. Three consecutive two-out extra-base hits fueled the big inning as sophomore shortstop Joe Goddard (pictured above; Wadsworth H.S.) got things started with a two-run double down the leftfield line. Sophomore first baseman Matt Anderson (Jackson H.S.) followed with a two-run double to left-center before senior catcher Alex Schmid (Canton Central Catholic H.S.) wrapped up the frame with a two-run homer to right-center. MVNU answered right back in the bottom of the second, though, pushing five runs across the plate to pull within 6-5. Back-to-back solo homers by junior second baseman Justin Shiflett (Zane Trace H.S.) and Goddard pushed the Pioneer lead to 8-5 in the top of the fourth but MVNU fought back once again, bringing home two runs in the bottom of the inning and then tying the game at 8-8 on a two-out RBI double in the bottom of the fifth. However, Malone immediately retook the lead with three unearned runs in the top of the sixth. Mt. Vernon Nazarene plated two runs in the bottom of the seventh and then had the tying run at second base with two outs later in the inning before Pioneer junior closer Bryan Bayer (Fairless H.S.) induced a pop out to extinguish the Cougar threat and notch his fourth save of the season. Senior lefthander Derek Smith (Norton H.S.) picked up the win (1-0) after tossing 1.1 innings of relief. Malone registered 10 hits in the game as Goddard went 4-for-5 with two runs scored and three runs batted in. Schmid went 2-for-4 with one run scored and two RBI’s while junior designated hitter Corey Hartong (Dalton H.S.) also posted two hits in four at-bats, including a two-out RBI double in the sixth that turned out to be the difference in the game. Malone plated one run in the top of the third and two more runs in the top of the fourth to take a 3-0 lead in game two. MVNU fought back to tie the game at 3-3 with an RBI double and a two-out, two-run homer in the fourth. The Cougars then took the lead for good the following inning with two unearned runs. The Pioneers put two runners on base in the sixth but were unable to bring them home as Mt. Vernon Nazarene held on for the 5-3 triumph. Freshman right-hander Jared Messer (Perry H.S.) went the distance on the mound for Malone, suffering the first loss of his collegiate career (4-1) after allowing five runs (three earned) on nine hits over his six innings of work. Messer struck out six while walking four. The Pioneers again registered 10 base hits in the game as Anderson went 2-for-2 with a pair of singles and a bases loaded walk that drove home a run in the fourth. Freshman leftfielder Matt Hamons (Willard H.S.) posted two hits in three at-bats with one run scored while Shiflett and Goddard both went 1-for-2 and drove in a run with a sacrifice fly. Malone will resume AMC play next weekend at Thurman Munson Stadium with a four-game series against Cedarville University. The Pioneers and Yellow Jackets will square off in a 4:00 p.m. doubleheader on Friday before playing another twin bill on Saturday starting at 1:00 p.m.
Greensboro, N.C. – For the second straight time the Oberlin College men’s lacrosse team found themselves on the wrong end of a one-goal game as they dropped a tough 12-11 decision in overtime to Guilford College on Sunday afternoon. Greg Nash scored the game-winner with an assist coming from Daniel Dowd just 47 seconds into the extra session. The heartbreaking outcome is sure to make the Yeomen’s ride back up north an extra long one as they how now dropped four games in a row with the last three coming by a total of just four goals. 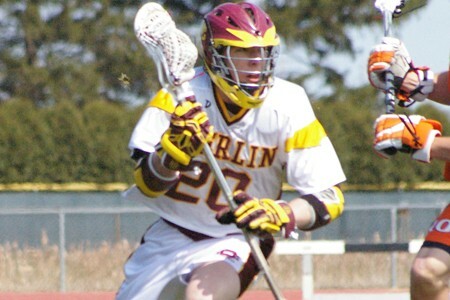 Thomas Hake led the Oberlin attack with four scores while Connor Jacksonand Erik Strand each added two in the game. Four straight Yeomen goals led to an early 5-1 lead, but the Quakers came storming back to grab a 7-6 edge at the break. Over the final 30 minutes of play, Oberlin was unable to regain the lead as all of their scores were matched by Guilford. The Yeomen were down 11-9 going into the fourth, but would cut the deficit in half on Hake’s fourth score with 7:00 left to play. It was Strand who would add the equalizer minutes later with an assist coming from Rob Bond. Unfortunately, the Yeomen could not sneak another shot into the cage to steal the win. Jon Weisburst recorded 11 saves on the day for Oberlin who also won the groundball battle 40-33 and 17 of the game’s 27 face-offs. The Yeomen will look to get back on track when they travel to Denison University on Wednesday night. Oberlin, Ohio - Molly Bloom and Alice Zicht each scored three goals, but it wasn’t enough as the Oberlin College women’s lacrosse team was defeated by Division I Howard University 17-8 on Easter Sunday. First-year standout Illyssa Meyer also added a pair of goals for the Yeowomen who fell to 3-4 with the loss. Oberlin grabbed an early 2-1 on back-to-back free position goals by Zicht and Bloom, but from then on the Bisons’ offense came to life as they built a 12-4 half-time lead and never looked back. The Yeowomen had no answer for the speed and quickness of Desiree Cox as she led all scorers with eight goals on the day. 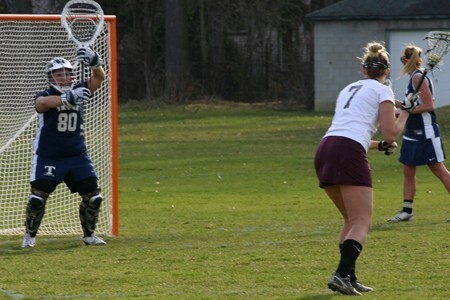 Rookie goalie Madeleine O’Mera made 12 save in the game. Oberlin returns to action on Wednesday evening when it welcomes Kenyon College to town for the NCAC opener. The game will be played under the lights at Fred Shults Field and will start at 7 p.m.